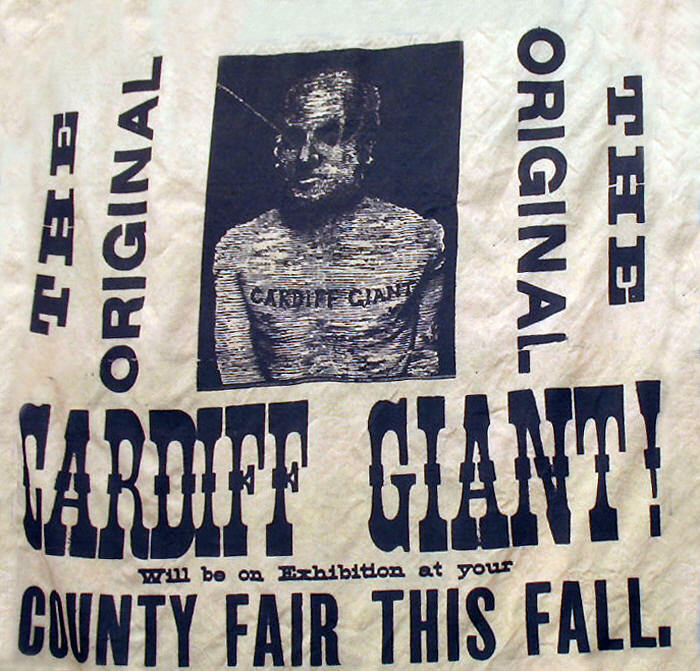 The Cardiff Giant, a gigantic ten-foot tall stone man, emerged out of the ground and into American life on October 16, 1869, when he was discovered by some workers digging a well behind the barn of William C. "Stub" Newell in Cardiff, New York. 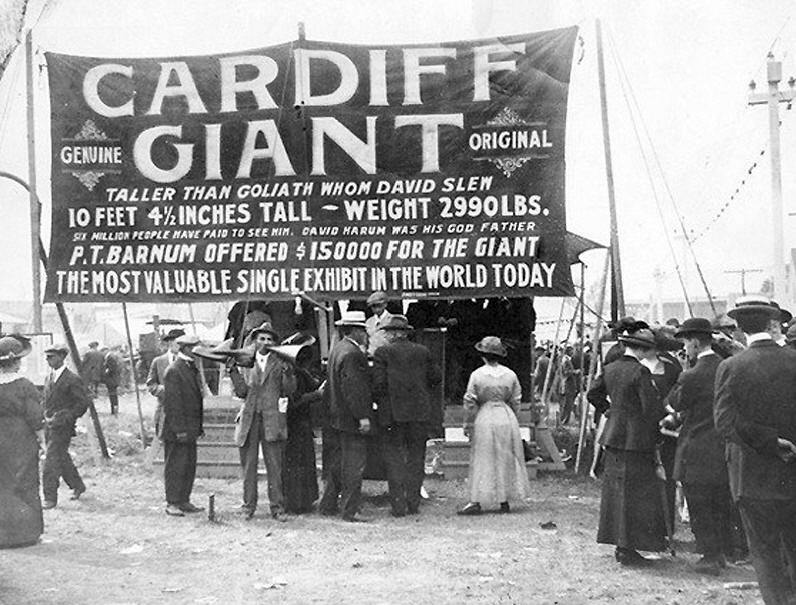 Word of his presence quickly spread, and soon thousands of people were making the journey out to Stub Newell's farm to see the colossus. 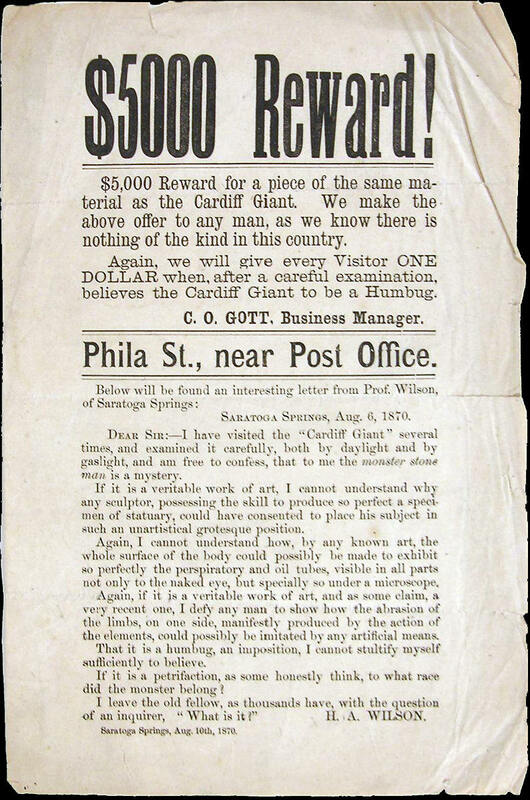 Even when Newell began charging fifty cents a head to have a look at it, people still kept coming. Speculation ran rampant over what the giant might be. The central debate was between those who thought it was a petrified man and those who believed it to be an ancient statue. 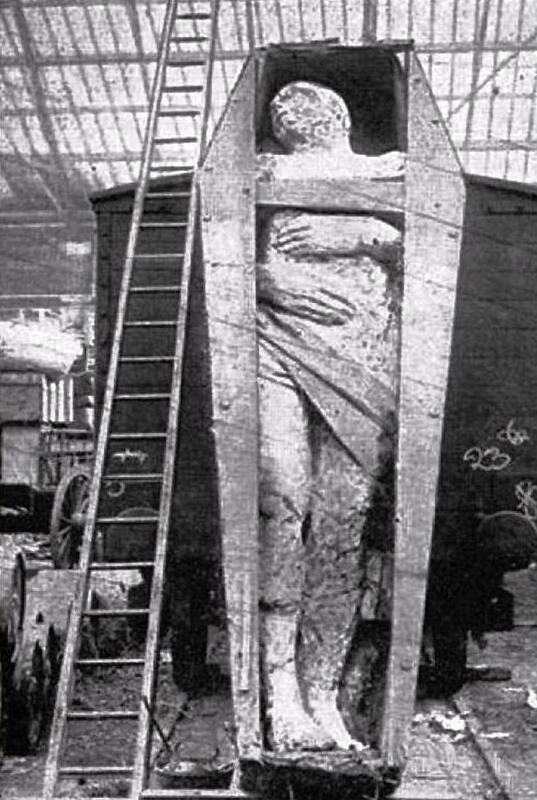 The 'petrifactionists' theorized that it was one of the giants mentioned in the Bible, Genesis 6:4, where it says, "There were giants in the earth in those days." Those who promoted the statue theory followed the lead of Dr. John F. Boynton, who speculated that a Jesuit missionary had carved it sometime during the seventeenth century to impress the local Indians. The truth was somewhat more prosaic. It was actually the creation of an enterprising New York tobacconist named George Hull. The idea of burying a stone giant in the ground occurred to him after he got into an argument with a Methodist Reverend about whether the Bible should be taken literally. Hull, an atheist, didn't think it should. But the Reverend disagreed. The Reverend insisted that even the passage where it says 'there were giants in the earth in those days' should be read as a literal fact. According to Hull, after this discussion he immediately "thought of making a stone, and passing it off as a petrified man." He figured he could not only use the fake giant to poke fun at Biblical literalists, but also make some money.